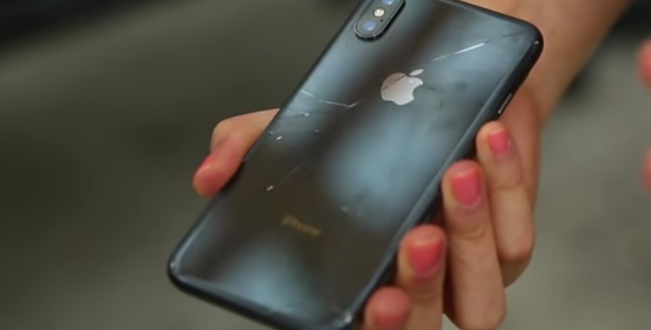 CNET Gives The iPhone X Their Drop Test [VIDEO] - Joe.My.God. If you just spent $1,000 or more on an iPhone X, put a case on it now! Apple’s tenth-anniversary iPhone has a slick new look with a nearly bezel-less screen, glass back and stainless steel frame. Just like the iPhone 8 and 8 Plus, the glass back allows the X to have wireless charging– but it also means you now have two breakable surfaces to worry about. Like our drop tests for the iPhone 8, our first drop was from 3 feet (0.9 m), or about pocket-height for most people. The back hit first, but it then did a small flip and landed screen-side down with the back facing me so I could see the damage immediately. The glass from three of the four corners cracked at different degrees of severity and scuffed up the side of the camera mount. The bottom right-hand corner took the biggest hit and had the largest fracture flanking the corner. Even the stainless steel on the frame looked chipped on this side where the phone hit the floor. The top right corner also had a small tear and scuff on the frame, and another tiny bump on the bottom left hand corner of the glass. Not good considering it was the first drop.